A few days ago I spotted a double-page ad in The New York Times, colored in golden hues, announcing the arrival of a new Restoration Hardware in Greenwich, CT, my old home town. The retailer which bills itself as “a luxury brand in the home furnishings marketplace,” has moved from its previous Greenwich location to much grander digs, The Old Post Office, built in 1916 and listed on The National Register of Historic Places. Then today, I learn that the landmark 1899 Post Office Tower in Washington, D.C was leased to the Trump Organization which plans to renovate and convert this historic beauty into a luxury hotel with all the gaudy trimmings associated with Trump. Yes, this is another there-goes-the-hood rant. Well, at least these classic icons did not meet up with the wrecking ball. Post offices are an endangered species after all. I noted that on the Restoration Hardware website you can purchase a cast stone “Greenwich Urn.” Yours for $389. “Substantial in presence and classical in detail..,” the urn copy reads. “Time and the elements will only enrich its weathered character.” The words could have been describing the Old Post Office. Looks like the charm bracelet is getting some play again. Look at these pricey sparklers! In Rebecca C. Tuite’s recently published book,”Seven Sisters Style,” the charm bracelet has a supporting role. Tuite reports it was a must-have accessory for the look once seen parading around the campuses of a group of East Coast colleges known as the Seven Sisters including Radcliffe, Smith, Vassar and Wellesley. “It was so representative of Seven Sisters style,” notes Tuite. I did not attend any of the “Sisters” – not with my SAT scores – but I did own a charm bracelet in my youth. Have no idea where it traveled to or remember any of the charms on it. “The most irresistible and alluring thing about a charm bracelet is its ability to tell a story unique to its owner,” says jewelry designer Tracey Zabar who authored the book, “Charmed Bracelets.” “Charm bracelets chronicle small moments in a life lived.” True. 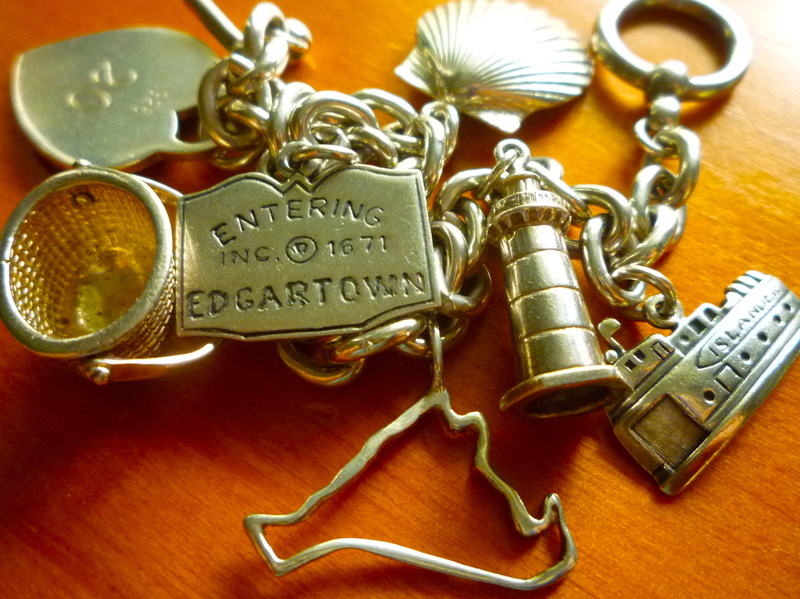 After moving to Martha’s Vineyard, I revisited the charm bracelet thanks to Jack who gave me one. Call it my Vineyard Charmer, top photo. There they are, dangling childhood memories from a life partially lived on this wonderful Island. I look at the “Entering Edgartown” sign and remember the excitement of crossing over the Edgartown line when arriving for the summer. To this day, the Edgartown lighthouse makes me misty-eyed. But the real flood gates opened the day the beloved ferry, Islander, made its last crossing from the Vineyard to Woods Hole in 2007. I sobbed dockside. The faded color photo of my mother and I on the Islander’s deck in the late Fifties came into focus as I watched another remnant of my childhood fade from view. I had never heard of St. John’s College (not to be confused with St. John’s University of Queens, NY, that is often tied to collegiate basketball’s March Madness). This St. John’s is in Annapolis and Santa Fe. Recently, its President, Christopher B. Nelson appeared on The New York Times Opinion page. In a Letter to the Editor, Nelson responded to a David Brooks column. So, how do we define “Great Books?” For St. John’s, they make up a curriculum consisting only of “original sources,” as Nelson’s March 11th blog, “Original Sources of Thought,” points out: “From Homer to Heisenberg (as in “Breaking Bad”), Plato to Planck, Euclid to Wittgenstein, Thucydides to Tolstoy – we study the actual works composed by foundational thinkers.” It’s a daunting group. “We study these original and timeless sources because they are in fact the grounding of all modern thought,” Nelson explains. “Grappling” with them, he continues, “will make a student better prepared to deal with the ideas of contemporary life.” Definitely food for thought. I wish I could experience any of St. John’s Seminars, just to listen to students and teachers navigate the intellectual mazes constructed by these influential thinkers. Alas, that is not an option. 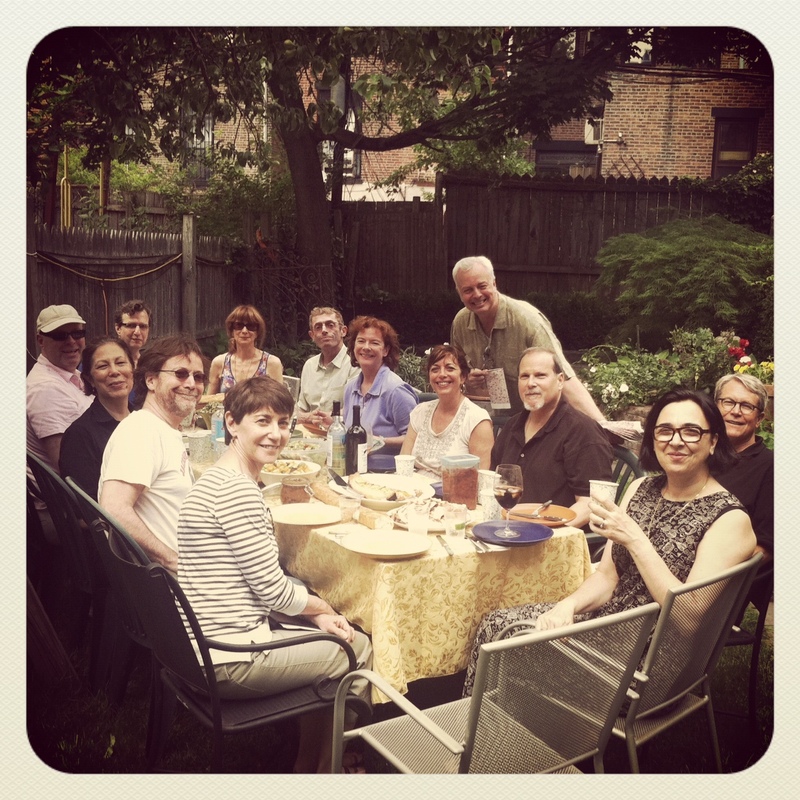 BUT what I do have, and it is not a shabby literary substitute, is my New York Book Group. Oh, what a grand meeting of the minds, all with I.Q.s vastly superior to mine. We are not into “intensive Greek studies” as St. John’s freshmen are, but this is the college English class I never had: One filled with stimulating – and often humorous – discussions, conflicting and unpredictable viewpoints (all the more juicy than a consensus). You LEARN, and leave mulling over pithy opinions, hungering for more. Speaking of books, let’s revisit an author to whom many would attach the label Great: Philip Roth. Recently, Roth sparked a bit of controversy in the Opinion pages of The Times. In her piece, “English Class With Mr. Roth,” Lisa Scottoline remembers one Roth-taught seminar from her English 275 class at the University of Pennsylvania in the ’70s. He never looked at his notes, nor did he leave any comments on the papers he graded, according to Scottoline. “We all wanted him to tell us how to write,” she remembers, but “by withholding his own personality, thoughts and opinions, he forced us back on our own personalities, thoughts and opinions. He made us discover what we wanted to write about, and to write about it the way we wanted to. I would need that feedback, but what student wouldn’t take away something from Roth’s teaching-at-a-distance style? To this day, Scottoline remembers that Roth loved a particular line from “Madame Bovary: “She was just eating a maraschino ice that she held with her left hand in a silver-gilt cup, her eyes half-closed, and the spoon between her teeth.” Doesn’t that speak volumes. Interesting segment on “60 Minutes” last night. It had to do with a group of 90+-year-olds and what keeps them ticking. In a 90+ study funded by the National Institute of Health, a group of 90-year-olds are checked from top to bottom every six months to evaluate their physical condition. They are also quizzed to see how their minds are working…or not. Ruthy Stahl, a perky 95-year-old jokingly says she feels “about 52.” She may look mature, but 95? No. The first findings of the study are inconclusive, especially when it comes to the causes of dementia. But there are certain commonalities the study reveals that seem to keep these folks moving right along. To join the Nonagenarian Set you should socialize, exercise, drink a little red wine and coffee and – here’s a new one: gain weight. But during the “60 Minutes” segment I kept asking myself: Do I really want to live to be 90+? Can I afford to??!! Maybe if I’m mobil, can see well enough to read a printed page and/or watch a film or what’s engrossing on TV – or whatever we’re watching at home in 20-odd years. Even more importantly, if my good pals have already gone to the great beyond, what’s the point of day-to-daying it solo? I thrive on sharing life’s ups and downs with these folks. The hood would be mighty lonely without them.